Dr. Jan Linhart has been placing porcelain veneers since the 1980’s, when this revolutionary dental procedure was first conceived. Since then, he has become one of the most trusted and sought after cosmetic dentists in Manhattan. Following in his father’s footsteps, Dr. Zachary Linhart has also found a passion for this area of dentistry. Since joining the practice, he has gained significant experience in this very technique sensitive procedure, which transforms discolored, crooked, or misshapen teeth into beautiful, white teeth that will last for decades. Porcelain veneers, or laminates as they are also called, are thin pieces of porcelain that are bonded to the natural teeth. These pieces of porcelain are hand crafted by a lab technician outside of the mouth, and then bonded into place by Dr. Linhart. Linhart Dentistry has been working with lab technician, Robert Kim, CDT, for over 15 years and he has made thousands of porcelain veneers as a master artist. Porcelain Veneers – What are the Benefits? Porcelain veneers are a cosmetic procedure to correct misaligned, discolored, or poorly shaped teeth. While orthodontic procedures such as Invisalign® or traditional brackets will straighten misaligned teeth, they will not whiten or change the shape of teeth. As a quick fix to discolored teeth, a whitening procedure can sometimes help, but it is only temporary and cannot fix tougher stains such as Tetracycline staining. Also, mottled teeth with lines or bands will not improve with whitening. Porcelain veneers are a quick, long-term cosmetic solution, as the process can take place in just a few days. If you have always hated the shape of your teeth, or have chips in your teeth or old fillings, porcelain veneers are a way to restore your teeth to the way they were meant to look. White, uniform, and stunning. Porcelain Veneers – Who Is a Candidate? 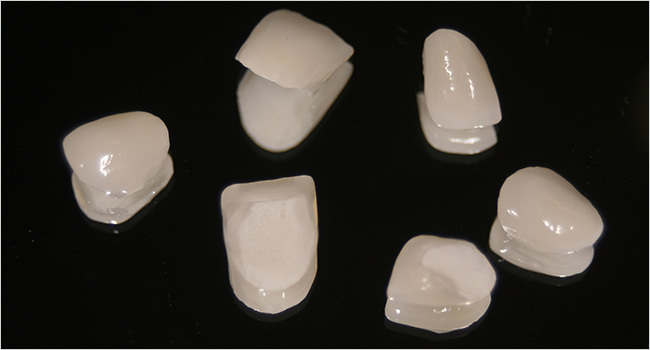 Porcelain veneers are a long term, permanent solution for the dental conditions described above. However, they are not appropriate for every patient! Orthodontics, PearlinBrite™ Whitening, and other cosmetic procedures are alternatives to porcelain veneers, and are always discussed with the patient before the decision is made to proceed with porcelain laminate veneers. Porcelain Veneers – What are the Costs? Porcelain laminate veneers are custom made on a per-patient basis, so it is impossible to list the exact cost of veneers. Each veneer is hand crafted by our certified dental technician, Robert Kim, and thus is unique to the patient. It should be noted that veneers are very cost effective in their longevity and customization. For patients with slightly crooked or stained, but otherwise reasonably healthy teeth, the cost of veneers is a fraction of the price of orthodontics, which can take years of treatment, and also requires regular whitening treatments to avoid discoloration. In the long run, veneers are certainly a cost, time, and energy effective option. Within a week, veneers can completely transform your smile. Porcelain Veneers – What is the Procedure? Impressions/Consultation: Impressions are taken and photographs of the original smile are examined. The photographs are discussed with Dr. Linhart and the patient in order to determine what is to be accomplished with the veneers. Our laboratory technician, using these molds and pictures, creates a realistic smile design in wax of what the patient’s new teeth will look like. This waxup is essential in building the smile from the finished, desired result. At this visit, Dr. Linhart prepares the teeth for the veneers. Impressions are taken and sent to the laboratory for veneer fabrication. Then, temporary veneers are made which act as a guide for the permanent veneers. Placement: The lab technician creates the customized porcelain veneers, and Dr. Linhart skillfully places these veneers in the patient’s mouth. The entire process can usually be accomplished in just a few days, requiring only two appointments, however Dr. Linhart is, of course, able to accommodate rush cases as they arise. Porcelain Veneers How long do they last? Two of the major questions that people ask when it comes to porcelain laminate veneers: What is the long-term success rate, and how long will the veneers last? Porcelain laminate veneers have a life expectancy of 15 years or longer, with many of our cases having been in for over 20 years! Veneers are stain resistant, very strong, and keep their original look for years. Of course, as with any dental procedure, veneers may last more or less than the average expectancy, and accidents such as breakage can happen as with natural teeth. 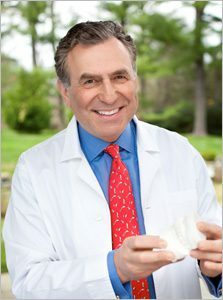 Dr. Jan Linhart is the top dentist working with porcelain veneers in New York City. As a professional who has been perfecting the art and science of dentistry for over 30 years, he maintains that veneers are conservative and highly effective, and the results are immediate, dramatic and long-lasting. Porcelain Veneers from Manhattan and NYC practice of Linhart dentistry maintains an impeccable reputation, which brings patients to his office from all around the world! Stop by his Manhattan office today!